The Friday ad hoc group met for the 2nd annual outing to Wintergrass, a bluegrass music festival in Bellevue, WA. I was there enough early to start a sketch while awaiting others. This is the Wintergarden atrium. 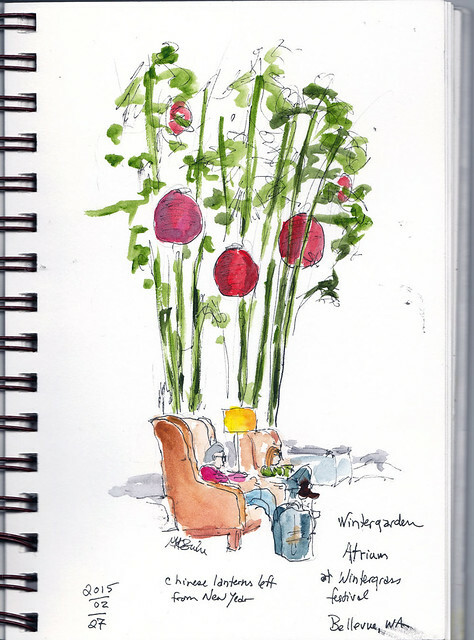 There are comfortable chairs and very tall bamboo plants, still with the red lanterns from Chinese New Year. This is a composite of various groups of musicians. The two standing on the right were actually together. But then they stopped playing and the group broke up so I couldn't get the rest of them. The same happened with the man on violin. I decided I could squeeze in one more musician if I could find one sitting down. I wandered the hall until I found one! I've been drawing from live, short-pose, costumed models at AFK Drink and Draw every week. I don't post them here as they're not Urban Sketches. However, the practice had noticeable effect today as I am now able to draw people quickly. Got to talking with a vendor who asked about the sketching we are doing at the gathering. I showed this one and she said, "That's Cliff!" She recognized the man on the right from the sketch! It helped that he has long white hair and beard. She said he's a well know teacher. My final sketch is a vendor. 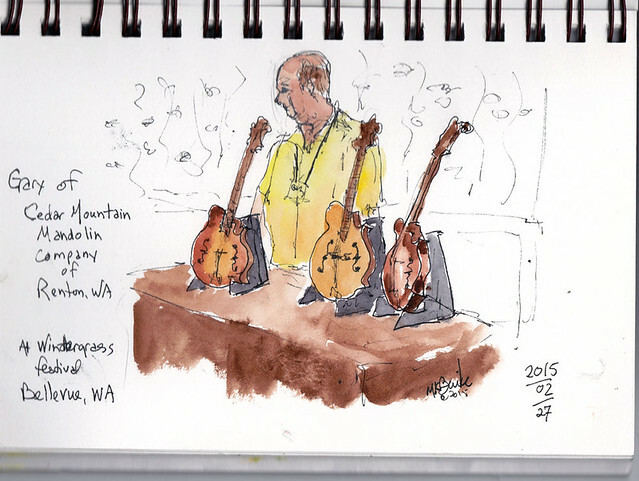 This is Gary, a mandolin maker in Renton! 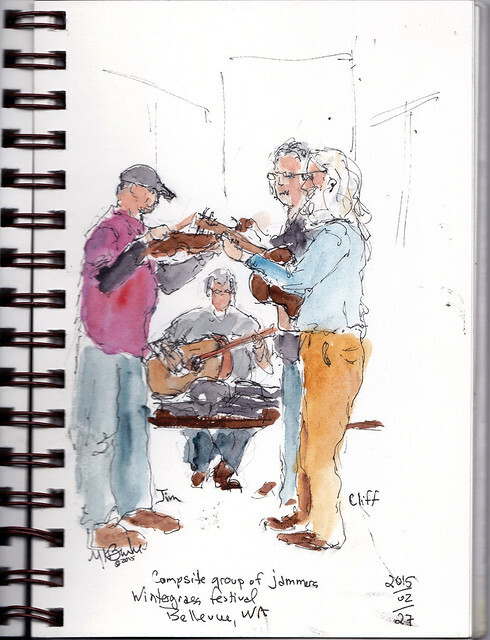 It's Cedar Mountain Mandolin Company. It's not so good a portrait as he was moving a lot, talking with customers. The mandolins held still, though! 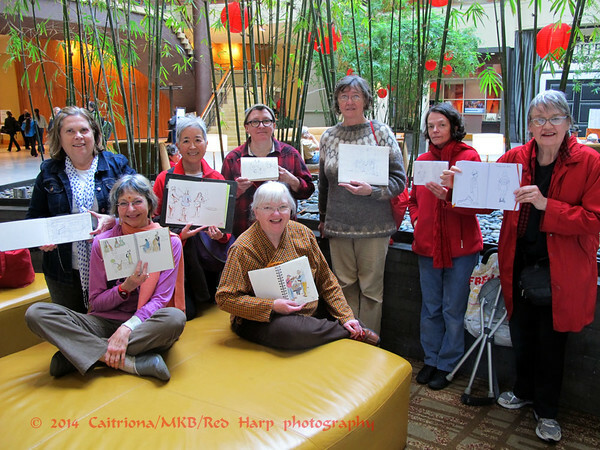 We gathered in the Wintergarden Atrium again to share sketches and have a group photo. Left to right: Vivian (new, from Stephanie Bower's "Good Bones" workshop last weekend! ), Natalie, Tina, Lynne (back), Kate (me; front), Gwen, Nilda, Nancy. After the outing, most of us had lunch together there. Then I went over to the UW bookstore. It's smaller than the main one. 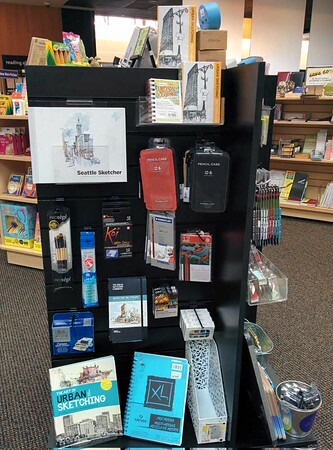 I saw this display with all of Gabi's books, the post card set (from the Urban Sketching book) and some appropriate supplies.